relatively simple materials. 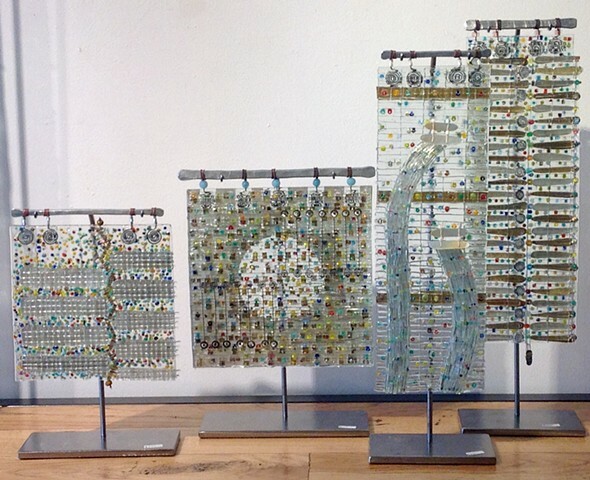 beginning with float (recycled window) or plate glass, pieces are cut and arranged with hand-cut glass shapes, glass beads, mica, copper, steel, aluminum. layers are created and then kiln-fired to fuse. once fired, assembled. everything is the result of the smaller parts constructing a whole. an entity which is the sum of its parts. language, landscape, architecture, physics, color. a necklace. a novel. so what i manifest is also in this spectre. choosing from thoughts and observations which make up an hour, a day, a lifetime. a horizon view, five matching flowers, poetry, a shoe pebble, rain, history, absurdity, pink on orange at 4 o'clock. elements of a moment recorded by physical presence. rituals of assembling, abstraction and order. polemics. illogical random acts of beauty. a documentation of time flying and patience. measuring time to see what it really looks like. trying to see something as it is, just different than expected. these are some things which fuel my work.